"Worthy of close attention from students of development thought and practice...Committed to alternative, democratic, socially equitable, and ecologically sustainable community development." "An insightful contribution to studies of counter trends from below against ... the unfettered globalization of democracy and free markets." "A refreshing critique of the concept of community-based development...Recommended for graduate students and faculty." 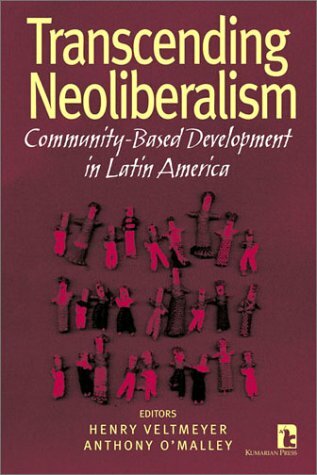 Transcending Neoliberalism examines the role of community, participation, decentralization, and empowering social movements in the quest for equitable development in Latin America. Over the past two decades, in the context of an epoch-defining process of globalization, a form of development has emerged that moves beyond the neoliberal focus on both market and state--one that reaches back for ideas into communities that have been created within rural and urban societies of developing and developed areas. Henry Veltmeyer lived and worked for six years in South America before coming to Canada to pursue a doctoral program in Political Science and subsequently beginning his academic career in the Sociology Department at St. Mary’s University. He has participated in the university’s Atlantic Canada Studies program and founded the program in International development in 1985. He also served for eight years as Coordinator of this program in addition to eight years as chair of the Sociology Department.